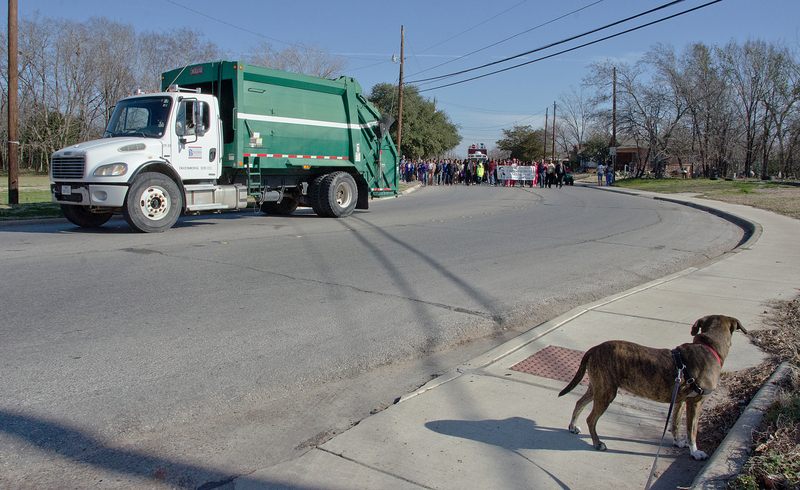 Bitsy and I like to participate every year in the parade, walking up Martin Luther King Street, behind the big, green garbage truck, around the corner in front of the African-American Museum on Pruitt Street, and then on through downtown to the school. 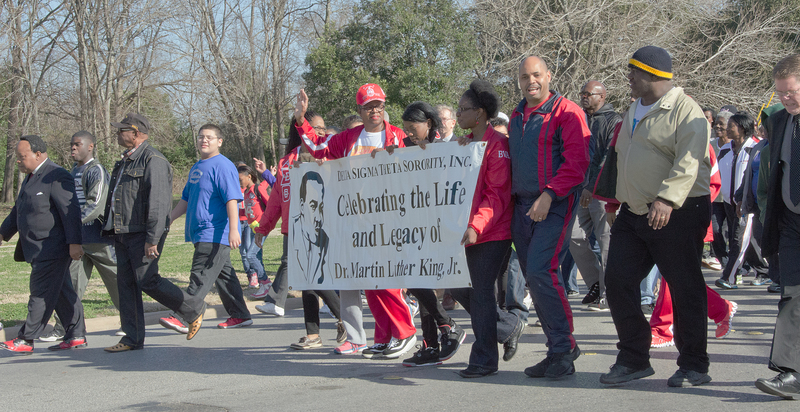 Bitsy loves a parade, and walking that way, with the community, brings to my mind a very simple, very important event in my life that had nothing to do with Martin Luther King, Jr. He was in college at the time. Unknown. I was in high school. It happened during our family cross-country road trip to – I forget where, but it was someplace in the south where we stopped at the fairgrounds and climbed up high in the old wooden outdoor grandstand to watch a horse show. Special treat for me. I was one of those horse-crazy girls, very blond, very white, very shy, raised up mostly in small-town California, really not very much concerned, not even very much aware of the various colors of human complexions. That must have been – good grief — in the mid-forties, about 65 years ago, more or less. So there I was watching the horse show in this strange place when nature called and would not be denied. So I climbed down from my perch, wandered around for quite a while and finally, unawares, ended up in the “colored” ladies’ restroom. And that’s pretty much the story. I don’t remember the details, only today the visual is photographically clear, as though those ladies have been standing still there in my head through all this time. I see a fairly long line of smiling, chattering black ladies who stopped stock still, maybe I should say shocked still, staring at me, as I went in, used the facility, and then left. I cowered under their glare. What? I thought. What did I do wrong? Some years later I understood — those ladies – that image in my head – represents the first important realignment of my world view. Yesterday morning I read another individual story on the web. The author claims that Rev. Martin Luther King, Jr., did not change white people’s lives, but only black people’s lives. That same afternoon, two of us white “girls” were brought nearly to tears talking about how Martin Luther King, Jr. changed our individual lives. Indeed he did; he changed the whole culture and we all are part of the culture. But, you know, he didn’t do all that changing by himself. In fact I doubt he did any of it by himself. And every person, white or black or other, then or now, who spends time and effort trying to understand the wisdom of Martin Luther King’s world view, was and is a part of his legacy – changed by his wisdom, changing our own world views to be more like his, continuing to change our world. MLK Jr was a wise young man. Sometimes we forget the wisdom; sometimes we forget his message and focus on his charisma, his courage, and character. But the measure of his legacy will be the changes we make in our own lives, not because of his charisma and courage, but because of the wisdom that he tried to leave with us. Nobody by himself, not me, not you, not Martin Luther King Jr., nobody can save a culture. But nobody can stop us all, as individual helpers, from studying, trying to understand and talking about what he was talking about (not what we want, but his own vision), trying to live by the wisdom, and so bringing his legacy into our culture. Martin Luther King was, most importantly, a wise elder to our entire culture. He explained the vision; it’s us, his helpers on both sides of the tracks, who bring the vision to life. This is my statement on this tenth day of November, 2016.